Environmental restrictions and regulations played a key part in this project to upgrade the last section of single track trunk road in the UK. The project involved the design and construction of approximately 7.5km of road of A830 Trunk Road between Arisaig and Loch Nan Uamh, a highly scenic area on the West coast of Scotland. A large section of the road is in a special area of conservation (SAC), so environmental issues were paramount. The project involved large quantities of earthworks (150,000m3 of peat and 350,000m3 of rock) and the construction of a number of reinforced concrete arch structures to cross the burns and watercourses at Larachmore, Brunery, Borrodale and Beasdale, along with a structure to support the new road at Larachmore Gardens. As rock blasting took place near to the railway line, possessions had to be booked and blasting designed to minimise the risk of damage to the existing railway infrastructure. 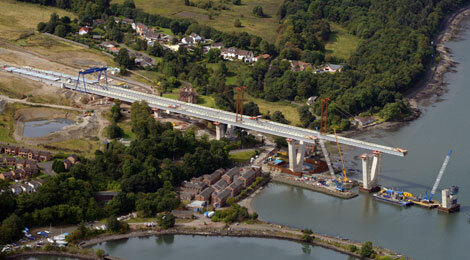 After the project won the the prestigious Saltire Society Award for Civil Engineering design in the Environment Category, Councillor John Laing, Chairman of The Highland Council’s Transport Environment and Community Services Committee, said: “I am delighted at this good news and this reflects the exceptionally hard work put into the project by the Council’s Project Design Unit based in Alness as well as the efforts of the Contractor, Morrison Construction. 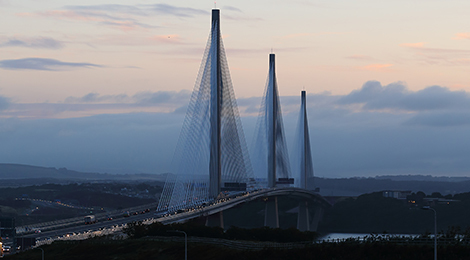 The Queensferry Crossing opened to traffic on 30 August 2017 and was officially opened by Her Majesty The Queen on 4 September 2017, the 53rd anniversary of her opening its neighbour, the Forth Road Bridge.